The Universal DRSSTC Driver V2.7 is the benchmark full featured multi-purpose DRSSTC IGBT Bridge driver for high performance Tesla Coils. It was originally developed by Steven Ward in 2009 and has since seen numerous revisions by Philip Slawinski, Bart Anderson, Eric Goodchild and myself, but all credit needs to go to Steve Ward for releasing this driver to the world. This latest revision comes with a lot of new features and has been fully tested in coils ranging from 20kHz up to 800kHz. The UD2.7C has been deployed in hundreds of builds all around the world with proven reliability and performance. Please see http://loneoceans.com/labs/ud27/ for a more detailed information. The UD2.7 is an advanced controller and the user should understand its operation before attempting to use it in a coil build. This board is also used in most of my coils such as my DRSSTC 2, DRSSTC 3, Model 81, Model 82 and other coils. Version 2.7 rev C, as of May 2015 - Recommended version - verified stable and working in coils all around the world (May 2016). I made a small run of white PCBs with black silkscreen and HASL finish, as well as black PCBs with white silkscreen and HASL finish. These boards are available while stocks last. Please see below. I send these boards out periodically for fabrication, typically when I need to use them when building my coils! If these boards are sold out, please check back this page frequently or drop me an email to let me know if you are interested. The listed prices are for a single un-populated PCB. These have been electrically tested at the fabrication plant as well. For detailed information on how to use the board as well as schematics and bill of materials, please see my comprehensive write-up here: http://loneoceans.com/labs/ud27/. Note that some passive components in the BOM may be back-ordered from time-to-time, so feel free to substitute similar components. Due to the large number of requests I get, I unfortunately will be unable to provide any additional support besides the documentation I've written up. 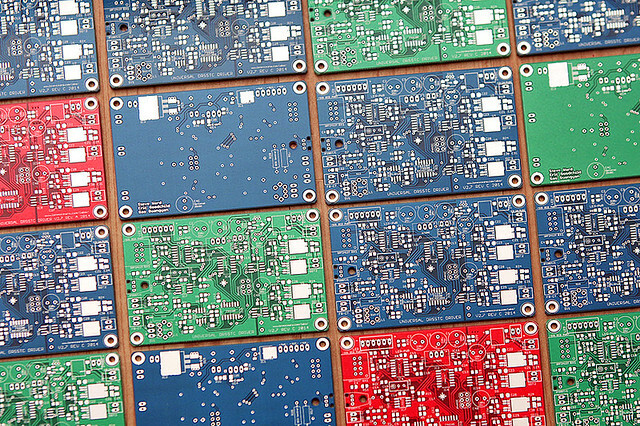 Blank V2.7C PCB (red soldermask) and HASL finish - New Stock for Sale! - $8 each. 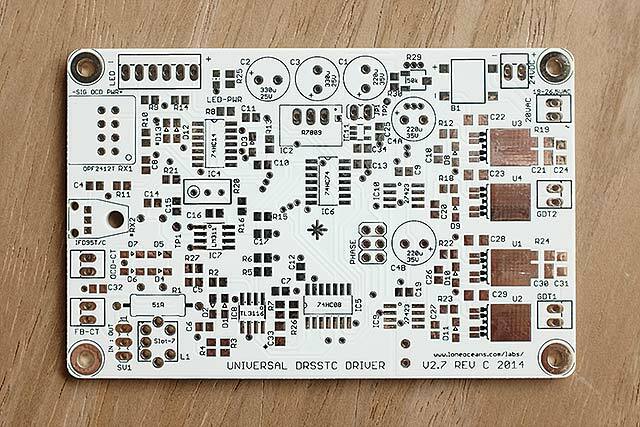 Blank V2.7C PCB (limited white soldermask) and HASL finish - Limited! $10 each. Blank V2.7C PCB (limited black soldermask) and HASL finish - Limited! $10 each. MIDI Controller 2 - Also available for sale and works great with the UD2.7C. See here for more details. *Populated and tested boards may be available usually with a 3+ week lead via a per-case basis and depending on stock. Prices start at $160 depending on configuration. All boards are assembled by hand via a new reflow process for professional results, and tested and verified on the bench. *Fiber receivers are priced separately due to their high cost at +$16 for ST fiber receivers and +$8 for IF fiber receivers. Note that I will be unable to conduct a full test of the board if no fiber receivers are populated. Boards are adjusted to 21.5V UVLO and C33 = 1nF for ~50 to 150kHz use, unless otherwise requested. Populated boards also come with Molex headers and crimp terminals. If the boards are sold out, please check this page periodically. If I do any more board orders, I will be updating this page. Shipping and handling is from the USA to anywhere around the world (not included but usually relatively cheap) starting at $8 for USPS Priority Flat Rate and starting at ~$17.50 upwards for international orders. Contact loneoceans [at] g mail [dot] com for enquiries and shipping configurations.